Big Fat Piggy Bank: Secrets of the Mountain Movie & Giveaway! Secrets of the Mountain Movie & Giveaway! I am very excited to tell you about a NEW action-packed made for TV movie, "Secrets of the Mountain" premiering on April 16th at 8/7c on NBC! I recently received a "Secrets of the Mountain" package from P&G and Walmart in exchange for my opinion. Well, all I can say is I am SO looking forward to seeing the movie Friday night! It's such a treat to have a movie on network TV that the whole family can enjoy! I remember how much I enjoyed family night growing up and it's nice to have that opportunity once again. 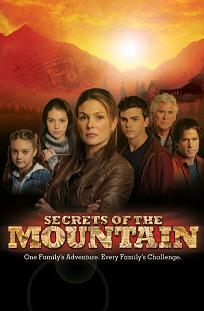 Secrets of the Mountain is an action adventure that focuses on family. It's central character is Dana James, a single mother, who takes her family to visit a mountain cabin they inherit from their Uncle Henry. They have no idea that they will be embarking on a journey to find an ancient secret that will challenge them as a family. The film reminds us that when times are tough families don't run away, they stick together. To celebrate the premier of "Secrets of the Mountain" one lucky reader will win the movie DVD and soundtrack (produced by Randy Jackson) after the premier April 16! These go on sale at Walmart on April 17th. All you need to do to enter is leave a comment sharing how you like to spend family time. Entries must contain a way to contact you (e-mail address, blog, etc.). You have until Thursday April 15th at midnight to enter. I'll announce the winner, selected by random.org, Friday April 16th! You'll have 48 hours to respond after winning or another entry will be selected. Enjoy! We like to spend time at the park as a family. Picnics and pushing the kids on the swing is the most relaxing way to spend the day. I agree. Growing up we watched Disney every week as a family. Its nice to be able to have family time and all of us enjoy the same movie. We enjoy watching movies together. We also take trips to zoos and parks for fun. We like to read after supper- at the moment we are reading Treasure Island to the kids. Ever since I had my twins we spend family nights watching movies :) When they get a little older, we will start going to the park! My husband and I have 7 children together. So, we enjoy spending family time taking the kids camping! It is about the only vacation that we can afford and we all have such a great time! My husband and I have 7 children and we enjoy spending family time taking the kids camping! It is affordable and I'm hoping that it makes some great memories for them! going to the park, the beach, playing in or backyard,reading books, playing games inside and watching fsmily movies together. We like to go together to a park - fun for everyone! We like to spend time outdoors during the day and curled up together watching a movie at night!